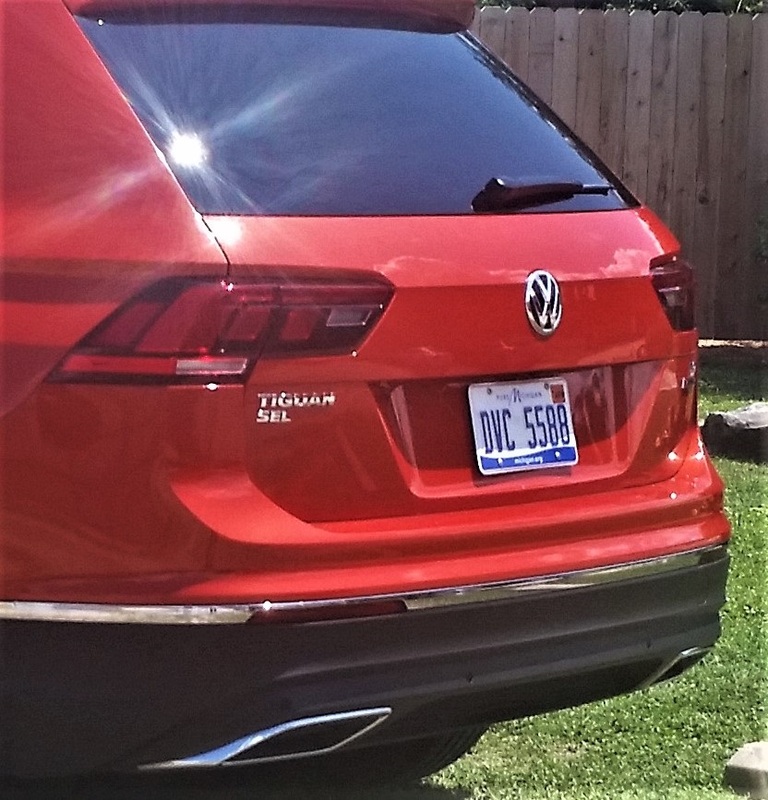 The all-new and larger second generation 2018 VW Tiguan compact SUV is arriving in dealerships now. 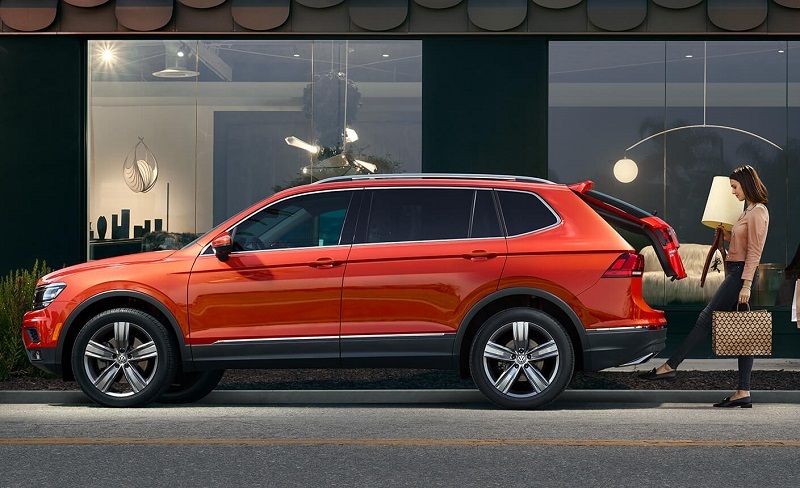 Bigger than its predecessor, but still a compact, the new Tiguan is nearly a foot longer with 58 percent more interior space enabling standard 3-row seating standard on FWD and optional on AWD models. 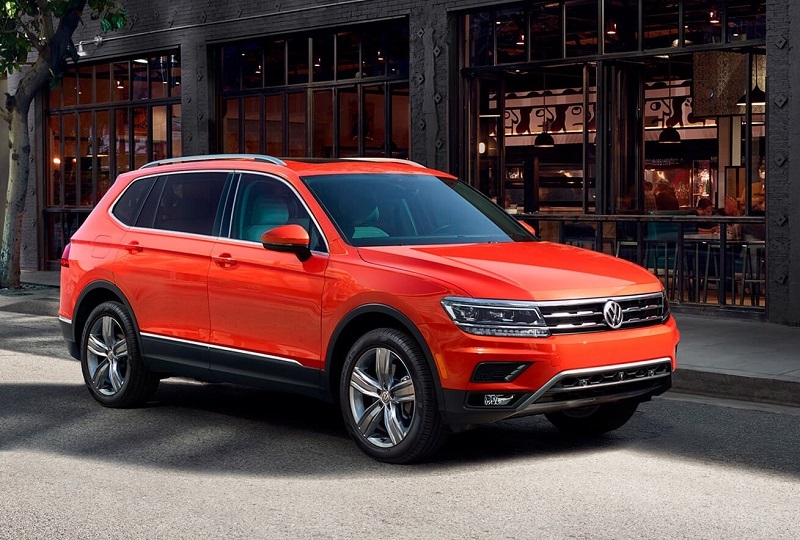 Aimed directly at the U.S. market – where bigger is usually thought to be better – the new Tiguan comes with more space, flexible seating, desirable functionality, current technology and lots of driver convenience and assistance features. 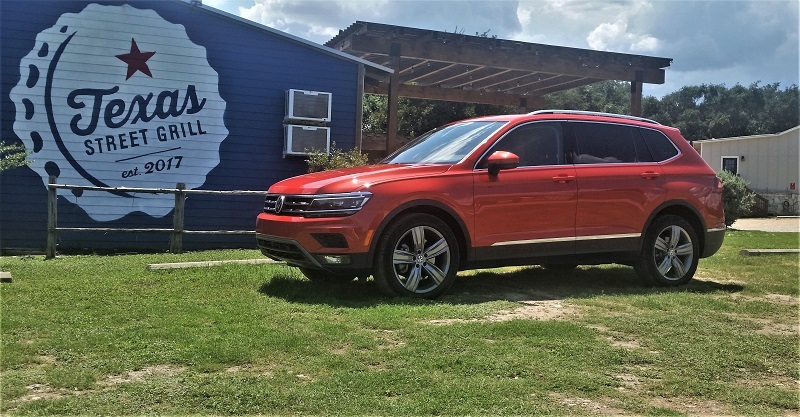 Starting at MSRP $24,595, the 2018 Tiguan offers four trim levels with FWD and AWD capability and, what VW says, its ‘fun to drive’ dynamics still intact. 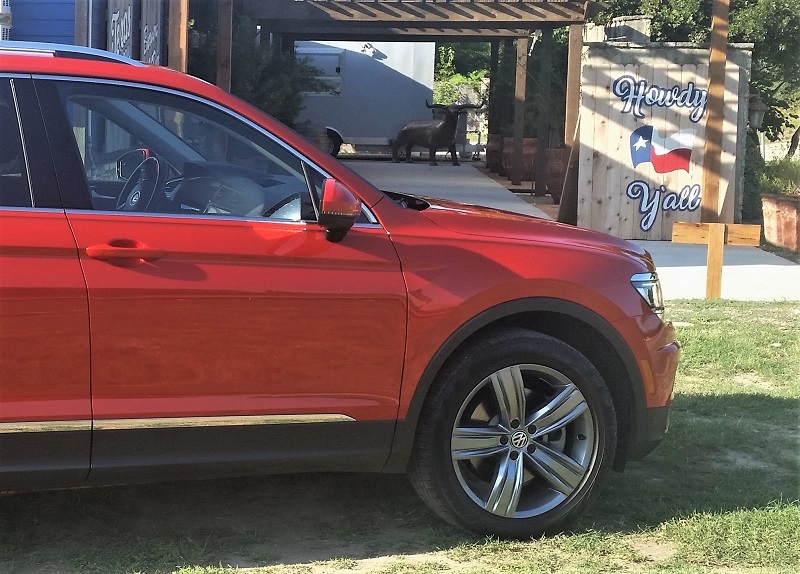 Following a week in a new 2018 Tiguan, we think they managed to get that pretty much right. Volkswagen did a nice job of equipping our top-of-the-line test Tiguan with everything – standard or optional that one might want or need. Except for a R-Line package (late availability), it was all there. Our Tiguan SEL Premium came in a hot Habanero Orange Metallic with Titan Black Interior and included the third row of seats. With a base MSRP of 37,550, adding the special color plus optional third row seating and delivery – its ‘in our garage’ price was $39,245. 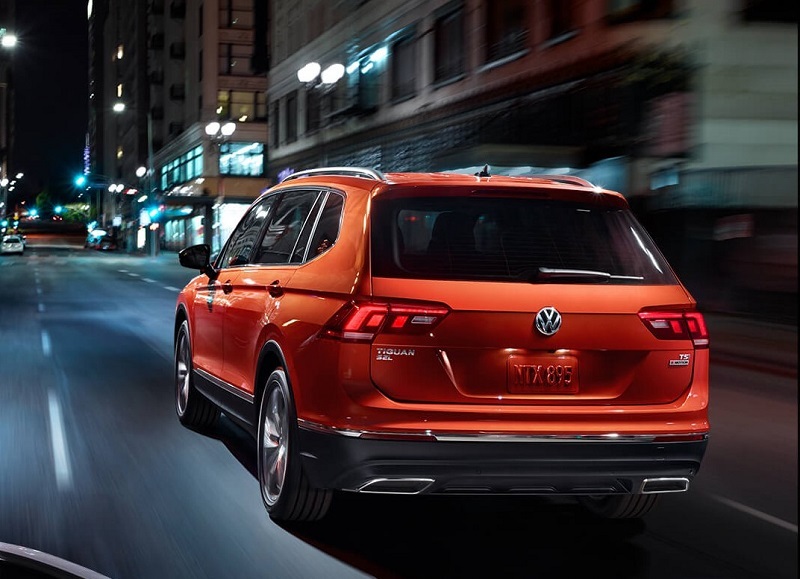 All 2018 Tiguan’s are equipped with an updated version of the EX888 four-cylinder turbocharged engine. 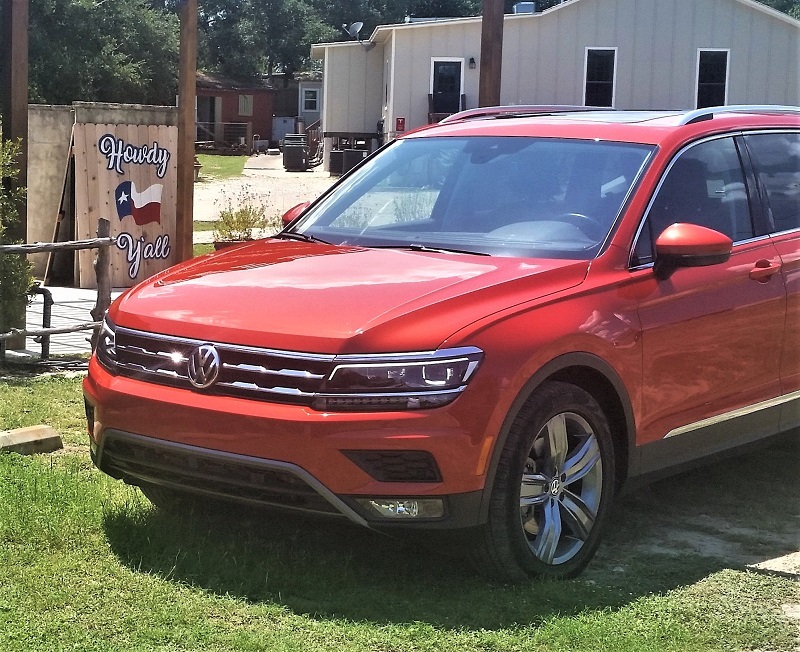 Interestingly, it produces 16 less horsepower but 14 lb.-ft. more torque than its predecessor, which might suggest lesser performance on this slightly heavier second-generation Tiguan. Not so, with the ‘equalizer’ – in our view – in the upgrade from the prior 6-speed to a new 8-speed automatic transmission. Fitted with Start/Stop technology, it delivers 184 horsepower and 221 lb.-ft. of torque with a fuel economy rating of 21/27 mpg city/highway and 23 mpg combined. Our test Tiguan was the VW 4-Motion with Active Control all-wheel-drive system model equipped with Hill Descent and Hill Start Assist. The Active Control has four settings: On-Road, Snow, Off-Road and Custom Off-Road. Within each setting, the driver can select Normal, Sport, Eco and Custom that adjusts engine control, gearbox, steering and Adaptive Cruise Control as appropriate for the conditions. 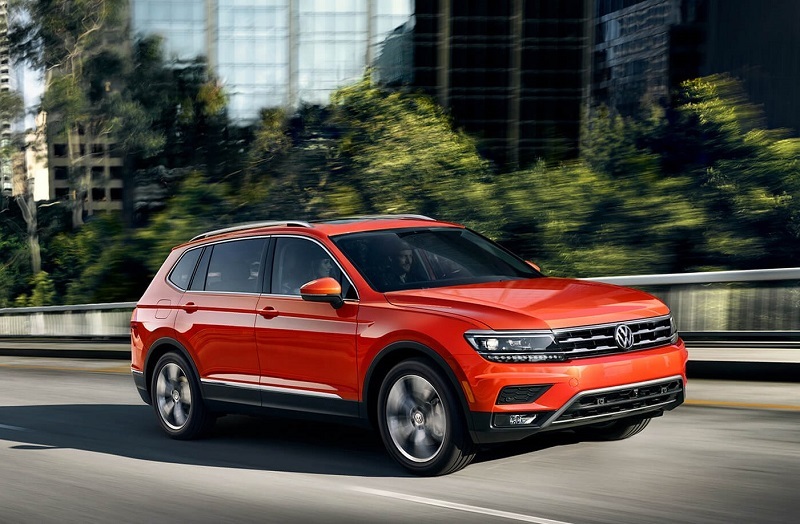 Though bigger and longer than the previous generation Tiguan, the MQB platform delivers a wider, lower stance that, running on its 19-inch “Victoria Falls” wheels, with its darkened lower skirting and cladding, the 2018 Tiguan displays a subtly aggressive posture. The foot activated hands-free Easy Open power liftgate includes an Easy Close feature with two button options. One to close it immediately and one to automatically close as you step away from the vehicle. With its 4Motion AWD system and 7.9-inches of ground clearance – augmented by 26-degree approach and 23-degree departure angles – the new Tiguan can be a credible performer in the outback as well. Roof rails are standard and allow installation of racks and carriers for those outback adventures. And, Tiguan can tow too, when properly equipped, up to 1,500 pounds. 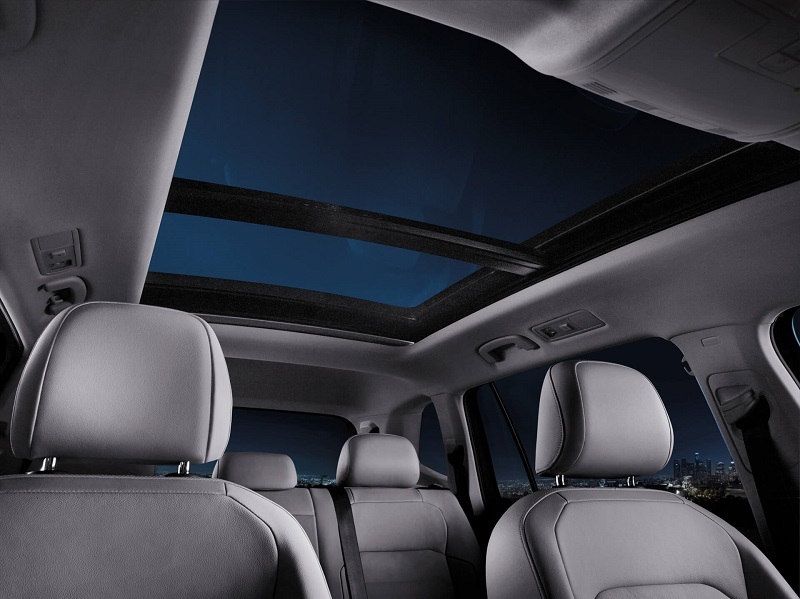 Light floods into Tiguan’s roomy cabin from the panoramic powered glass tilt-and-slide sunroof. If features a front opening glass panel with a fixed glass panel at the rear. A single touch sunshade enables light management during the day. At night, the ambient lighting around the edges provides subtle lighting as desired. A sporty, driver-focused, layout features refined gloss-grey and chrome detail. The multifunction steering wheel and seating are leather and heated. We really liked the second-row seating with its well-padded cushions, near 56-inch headroom and almost 39-inch legroom. In addition, the leather surfaced 40/20/40 fold down seats recline and also slide (up to 7-inches) fore and aft. With air conditioning vents and USB ports adding flexibility for cargo and convenience – a very comfortable space for rear passengers. We would skip the third-row seating (it came optional on our AWD) as it is not really functional as seating with its under 34-inch headroom and barely 28-inch legroom. The space is better used for cargo increasing that capacity from 12 cubic feet to 37.6 cubic feet. 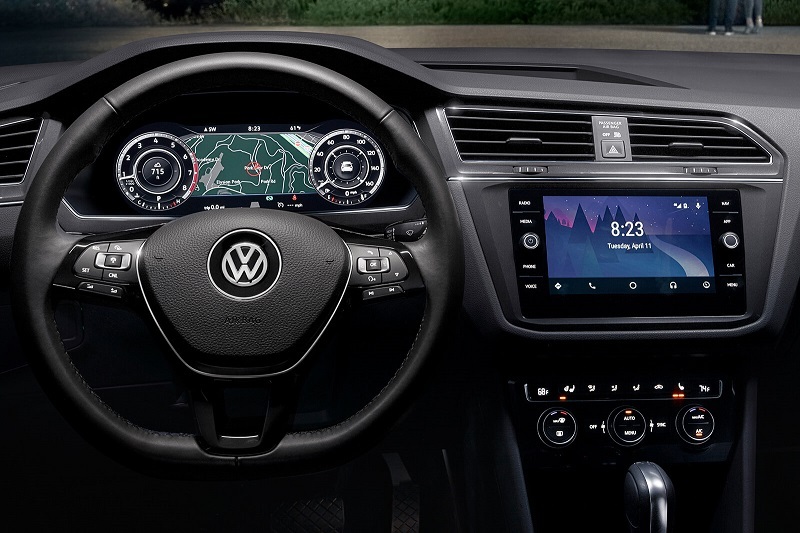 Tiguan is fitted with the VW MIB II infotainment system and ours came with the Discover Media System featuring the very bright 8-inch color display. Functional elements include three USB ports, SiriusXM and HD radio, Bluetooth handsfree and streaming capability plus more. The awesome Fender Premium Audio came standard on our SEL Premium. Sporting 480-watts and a 12-channel amplifier, it delivers a super audio experience through its 9-speakers including Super Twin front-door speakers and Bassman subwoofer. 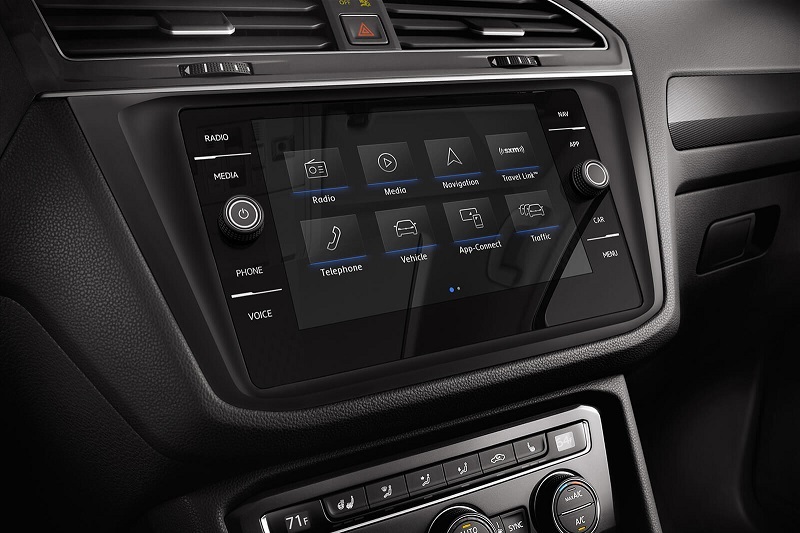 Volkswagen Car-Net connectivity system – embedded within – provides a wide range of services for the driver and passengers. Learn more about Car-Net here: http://www.vwcarnetconnect.com/. Some of the Safety Features are Electronic Stability Control (ESC), Anti-Slip Regulation (ASR), Anti-lock Braking System (ABS) and Tire Pressure Monitoring System (TPMS), Automatic Post-Collision Braking System and more. Driver Assistance systems include including Forward Collision Warning and Autonomous Emergency Braking with Pedestrian Monitoring, Blind Spot Monitor with Rear Traffic Alert, Adaptive Cruise Control, Lane Departure Warning and Lane Assist, front and rear Park Distance Control with Maneuver Braking (ParkPilot), High Beam Control and Overhead View Camera. The 2018 Tiquan compact crossover is available in four FWD trim levels priced (MSRP) as follows: S ($24,595), SE ($26,750), SEL ($31,090) and SEL Premium ($36,250). All trims are equipped with the 2.0T turbo I4 and mated to an 8-speed automatic transmission. The VW 4Motion AWD system is available on all trims for $1,300 more. Delivery adds $995. The third-row seating is standard on the FWD and optional ($500) on the AWD models. For those fans of the VW R-Line Performance Package, one will be available later. It will include high-gloss front bumper with large air inlets, a unique rear bumper, wheel arch extensions, R-Line side skirts and aluminum alloy 20-inch “Braselton” wheels – for $1,495.